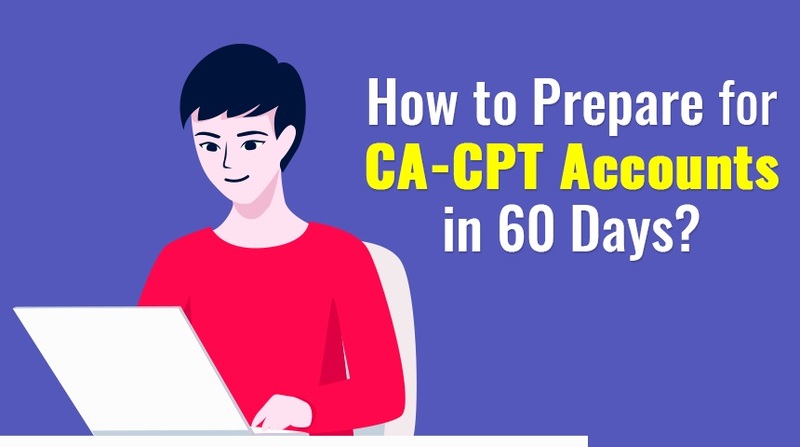 How to Prepare For CA-CPT Accounts in 60 days? Accountancy is the most important subject for Chartered Accountants. Students aspiring to crack any level of CA exam should know how to master the basics of Accountancy by understanding important concepts, and using them to solve business problems. But before that, students appearing for CA-CPT exams should apply the basic concepts of accounting to answer MCQs correctly, and fetch maximum marks in the exam. So, what should you do just two months before the exam to score maximum marks? Read on to know all the CPT Accounts preparation tips revealed by our CA expert. Why is Accountancy Important for CA-CPT? In CA-CPT exams, students are tested on four different subjects, out of which maximum marks are allotted to Accountancy. Hence, according to weightage Accountancy is given the highest importance in CPT. Students have to secure minimum 30 percent to clear the paper. So, reasonably, students are advised to give Accountancy its due precedence while preparing for CPT. But, what if Accountancy is your weak spot? Well, don’t freak out just yet! There’s some good news for you. Being a practical subject, Accountancy is easy to score in, especially if you had opted for commerce in +2. Also, the syllabus for CA-CPT Accounts tally a good deal with the syllabus of B.Com 1st year. For the rest, you can fall back on the tips for CPT Accounts suggested by our CA expert, and the study planner given below. How to Plan Your Studies 60 days before your CPT Exam? a) Course Contents of Fundamentals of Accounting includes 9 units with few of the very important chapters including Company Accounts, Special Transactions and the Introductory Chapters. b) The essential and desirable attributes if you are aiming at a good score in Accountancy is Complete conceptual knowledge and in depth knowledge of GAAP, Accounting Standards and basics. * The study plan is just a sample and can be customized by students to suit their needs. Those students who are already done with coaching should devote a majority of their time in revising the difficult portions, and then they can switch to the simpler topics. The idea is to revise the whole Accountancy syllabus in 60 hours over two months. Which Chapters Carry More Weightage? - Chapter 1to 3 -Book keeping Aspects of accounting - Understand Concepts, Accounts to be Debited/Credited; Nature of Accounts; Journal Entries, nature of Accounts, Subsidiary Books & Nature Of Transactions, Ledger postings, Petty Cash Book, Three column cash book, Amended Cashbook, Statements of BRS Debited / Credited. Rectification of errors-Effect on Trial Balance; Effect on Profit, nature of Errors, Rectification entries. Also, Accounting Concepts, Principles & Conventions; Meaning & Scope of Accounting, Accounting standards, Policies from Introduction to Accounting. - Chapter 4- Inventory Valuation- Techniques of Inventory Valuation, Problems on Techniques of Inventory Valuation. i. Bills of Exchange- Problem on Cost of goods manufacture, prime cost, Number of units produced,Journal Entries. iii. Goods sent on sale or return basis -Ordinary sale method (First Model),Separate Day book method. iv. Joint Venture- Joint Venture Account and Settlement of Accounts with other co-venturers. - Chapter 8 and 9- Partnership and Company Accounts: Introduction to Partnership Accounts; Treatment of Goodwill, Admission of Partner, death of partner, Journal Entries on Admission/retirement, Method of Goodwill valuation, Treatment of JLP, Revaluation A/C, Ratio Calculation.Issue of shares; Forfeiture of shares, Securities premium, Problems on Issue of shares; Problems on Forfeiture of shares, Reissue of Forfeitures, Disclosure of items relating to issue of shares in final Accounts. What are the most common types of MCQs asked? Questions based on Trading a/c / Profit and Loss account / Balance sheet. What are the most Commonly Faced Problems in CA-CPT Accountancy? - More Practical Based MCQs: There are more practical based MCQs than theory ones these days. Some MCQs can be lengthy and time consuming. Spending too much time on one MCQ disturbs the time distribution for the rest of the paper. Solution: Save the lengthy ones for the last, and to become a pro at practical problem based MCQs, do as many rounds of revision as possible before the exam. - Mixing up Journal entries: This is another weak spot where students tend to lose maximum marks. Solution: Stay calm and focused while answering questions in the exam. Check twice before answering MCQs pertaining to journal entries. - Making silly mistakes while calculating: Together with exam jitters and a ticking clock, these mistakes seem to be unavoidable, and costs students chunks of marks. Solution: Practice more to gain confidence. Rely on the calculator more than mental maths during exam, and do complex calculations at least twice before answering. - Wrong interpretation of questions: When it comes to theory based MCQs, students exhibit a tendency to goof up by interpreting the questions wrong. Solution: The most important tips for CPT accounts are: Take your time, and Master your mind. Yes, the clock is ticking, but answering questions wrong in the rush will not do any good. - The syllabus seems too vast to complete: This is a perpetual cause of woe among students appearing for CA-CPT every year. Solutions: Plan your studies strategically, and give more importance to certain chapters like Accounting Standards, Company Accounts, Capital and Revenue Expenditure and . . . .
Avoid starting with brand new chapters just 30 or 40 days before the exam. Focus on what you know and revise them repeatedly. Always remember that practice equals speed. Refer to the study plan chalked out by our expert and tweak it to suit your needs. Most importantly, take good care of your health. You surely don’t want to fall sick before your CPT exams..